First Intermediate Period: a time of climate crisis? 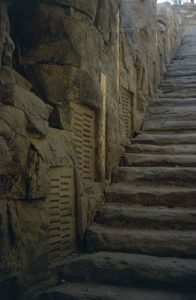 A Nilometer on Elephantine Island (Nile Valley Tours) – This ancient Egyptian device measured how high the Nile floods were each year. The end of the Old Kingdom, around 2100 BC, seems to have been caused by a major climate change. In Egypt, there was a terrible drought – the Nile failed to flood, or flooded less than usual, so there wasn’t enough water to grow enough food. Then food shortages led to rebellions among the nomarchs – the governors and rich people. They thought that the Pharaohs weren’t doing a good job. During the Old Kingdom, the Pharaohs had gotten more and more dependent on the government officials under them. Now these government officials grabbed power. Some of the organization of the country collapsed, and everybody was poorer. Nobody could afford to build pyramids or fancy palaces anymore. Egyptian writers make it sound really awful to live through. Rich men and women were working in the fields. The First Intermediate Period was a terrible time to be around in. People were killing their parents, brothers were fighting, and tombs were destroyed. Probably a crisis that was hard on rich people was much harder for ordinary people. 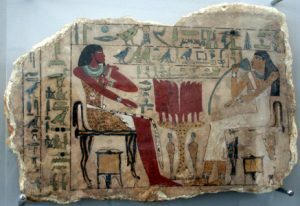 Tomb stela of Nemti-ui, from the First Intermediate Period. The stele’s only painted, not carved, because people couldn’t afford carving. This terrible drought in Egypt also affected West Asia, where the Akkadian Empire fell apart. Here, too, people were not as rich as they had been before. There were a lot of wars. The crisis seems to have affected Central Asia too. In Central Asia, the climate crisis may have forced the Indo-Europeans to begin a great migration and spread out all over Europe and Asia. India seems to have felt the effects of this crisis too. There, the Harappan civilization collapsed. Again, there were several hundred years where people were poor and there were a lot of wars. The Oxford History of Ancient Egypt, by Ian Shaw (2002). History of Ancient Egypt: An Introduction, by Erik Hornung (1999). A college textbook. On the conservative side – not much on new developments. Ancient Near Eastern History and Culture, by William H. Stiebing (2002). Expensive for a paperback, but brief and very up to date. And yes, it includes Egypt in the Near East. Cite this page: Carr, K.E. When was the First Intermediate Period? – Ancient Egypt. Quatr.us Study Guides, June 14, 2017. Web. April 20, 2019.